A high level stakeholders’ Workshop on the problem of pollution around Taj Mahal was conducted by the Ministry of Culture in Agra on 3rd June 2018. The Workshop was Chaired by Minister of State (I/C) of Culture and Minister of State for Environment, Forest & Climate Change Dr. Mahesh Sharma. The Workshop was called to discuss the issues of pollution around Taj Mahal with a focus on drawing short-term and long-term measures to deal with the problem and to protect the Taj from environment pollution. The Workshop was attended by DG, ASI, Smt Usha Sharma; Additional Secretary, M/o Environment, Forest & Climate Change Shri A. K Mehta, representatives of State Government, local administration , local administration of neighbouring districts to Agra, local MPs, MLAs, representatives of UNEP, Central Pollution Control Board and other stakeholders from the public, industry, environmentalists etc. The Workshop was followed by the Taj Declaration to Beat Plastic Pollution and pledge was taken to make areas around the Taj Mahal free from litter. It was also decided to take immediate steps to reduce single-use plastic around the Taj Mahal. The pledge was taken in the presence of Dr. Mahesh Sharma; Executive Director of UNEP, Mr Erik Solheim; UNEP Goodwill Ambassador and Actress Ms. Diya Mirza; local MPs, MLAs, local administration among others. Dr Mahesh Sharma called it a historic moment that the message of Beat Plastic Pollution is being given from the iconic monument Taj Mahal not only to the people of Agra and the country but to the whole world. Dr Mahesh Sharma also reminded the people of the Swachch Bharat dream of the Hon’ble Prime Minister Shri Narendra Modi. He further added that the Government is committed to holistic development of Agra in which the Centre, the State, local administration and all agencies will work under single umbrella and will also take along the common public of Agra in the process. Mr Erik Stein of UNEP expressed happiness that the UN slogan of Beat Plastic Pollution for this year’s Environment Day is being highlighted from the Taj Mahal which is the global symbol of love. 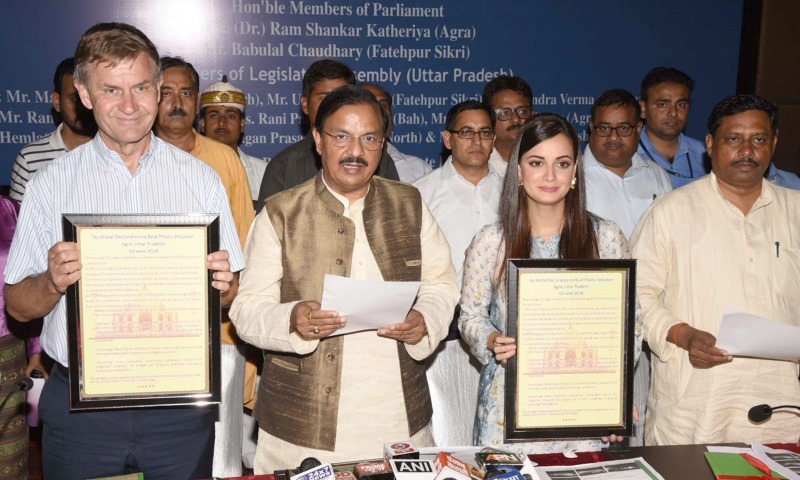 Ms. Diya Mirza also expressed happiness that all agencies together are taking forward the message of pollution free Taj Mahal. She believed this will send a strong message to the world about harmful effects of plastic pollution. “To bring down the negative impact of pollution, it is responsibility of each individual to reduce plastic use in our everyday life,” she added. Dr. Mahesh Sharma, Mr. Erik Solheim and Ms. Diya Mirza also participated in the Clean Yamuna Programme on the riverfront along the Taj along with representatives of various other agencies. This move comes weeks after the Hon’ble Supreme Court of India had slammed the ASI for not doing enough to protect Taj Mahal from pollutoin.